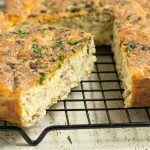 Our Easy Low Carb Beef Breakfast Casserole is delicious and budget friendly! It is a great option for anyone in a rush, just make ahead and reheat quickly in the microwave before running out the door. Place a non-stick frying pan over high heat. Add the olive oil, onion and paprika and saute until the onion starts to turn translucent. Add the ground beef and break up with a spoon. Cook until well browned. In a large mixing bowl, crack the eggs and add the cream, salt and pepper. Whisk until the ingredients are well combined. Add the grated cheese, reserving 3-4 ounces for the top, and mix well. Add the browned beef into the egg mixture, mix well. Pour the mixture into a 9x13in casserole dish and sprinkle the remaining cheese over the top. Place the casserole in the oven and bake for 40-50 minutes, until the egg barely jiggles at all when moved. Remove from the oven and leave to sit for 5 minutes before cutting into portions.